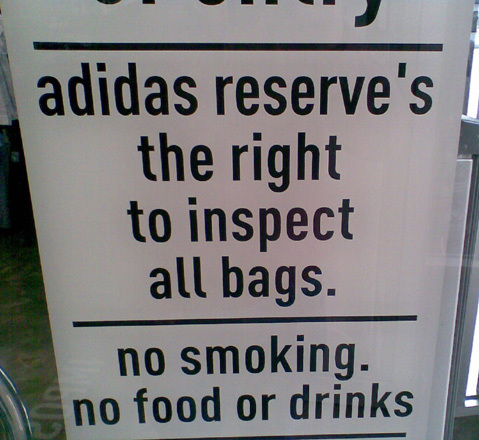 The Grocer's Apostrophe - "Reserve's"
And it's not just the apostrophe. Why use full stops in some places but not in others? HEH. There's a blog of photos like this somewhere - I subscribed for a couple of weeks but in the end I had to scratch it because it annoyed me too much. I infer from long study of these signs that there must be a widespread perception that if a word ends in S and there is a vowel before it, then you bung in an apostrophe no matter what kind of word it is. Hence lettuce's, sausage's, tomato's etc etc. Still, I can't remember the last time I saw it used with a verb like this, vowel or no vowel. But it's not confined to tradespersons, who at least don't use language for a living. I'm sorry to report that the most recent (and really appalling, if I remember rightly) apostrophe outrage I've seen was on a media release from a literary publisher. As Genevieve says it's annoying and depressing. Trouble is I'm now finding I have to walk away from an offending article, work out where the error is and go back and re-check. I almost don't trust myself to make the correct call, as these sort of things are so commonplace. I can see apostrophes dying out in the next 20 years or so. In fact I'd prefer it if signwriters dropped it altogether. For some reason, I find the absence of the aprostophe preferable to its misuse. Ah, misapostrophication. I'm always sorely tempted to lick a finger and erase these errant apostrophes from cafe and restaurant blackboards! What's so strange about this one is that it's printed. Surely, given the size of the company it's been written for, it would have had to go through various stages of approval and editing. At least the people here can change it easily enough. John Berry found an example in Seattle where the store has it painted on their windows [http://johndberry.com/blog/?p=305]. By the way, if you're fixated by fonts then John's your man. Kerryn, I'm starting to think your idea that the problem is caused by words ending in a vowel is the correct one. Except for the classic "it's" [see John above], which seems to spring up everywhere. This page contains a single entry by Perry Middlemiss published on October 19, 2009 9:53 AM. Poem: The Lost Poet by Nellie A. Evans was the previous entry in this blog. A Pardon for "The Breaker"? is the next entry in this blog.